Badger Aviators was founded by Greg Oudheusden, and his fellow classmate Alex Van Orsow in 2009. The club was founded with a strong commitment to "dispel any notions that it is impossible or impractical for college students to fly". We aim to introduce the UW community to the joys of flying and potentials of aviation. We are a 501(c)(3) nonprofit student organization registered with the Wisconsin Involvement Network (WIN) at University of Wisconsin-Madison. There are NO membership dues for joining! Being a pilot is NOT a prerequisite to join! If you've never been in the air and wish to discover the joy of flying, we would love to show you around both at the airport and in the air. 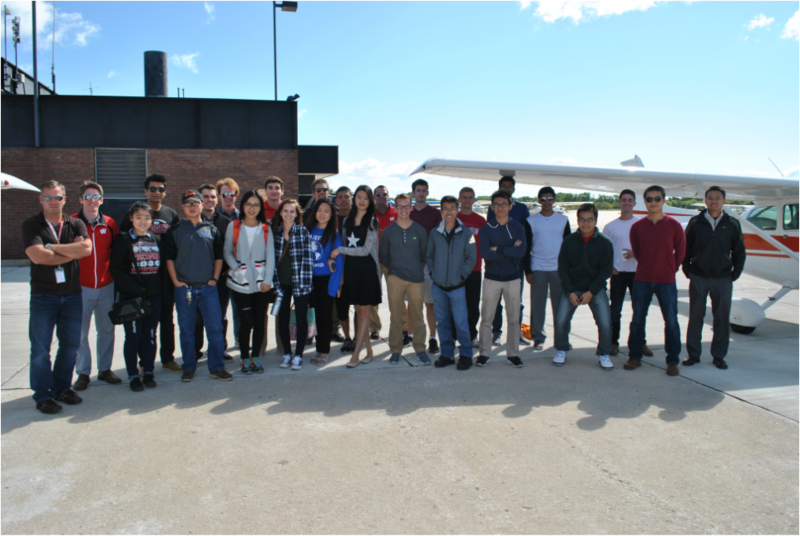 If you are a pilot, you will be joining a group of aviation enthusiasts ranging from undergrads to industry professionals. We are made up of not only engineers, but also English majors, Legal Studies majors, psychology majors, and many more! For those looking to get a taste of flight, flyouts offer a way to get up in the air with an experienced pilot and experience the thrill of flight for yourself. It's group outing to another airport in Wisconsin, often for breakfast or lunch, a museum, or other point of interest. These events offer a chance to see how much fun flying can be. For those who are already certificated pilots, flyouts provide an opportunity to meet up with other aviation enthusiasts, and an opportunity to fly more often. Sit back, relax, and enjoy opportunities to hear from prominent individual's in aviation-related fields. It's a time to learn about different career paths and hear about the incredible experiences that others have had in aviation. For those who aspire to a pilot's license, this is your ticket to adventure. Taught by one of the club's most experienced pilots, the ground school will prepare you to take the FAA Private Pilot knowledge test, one of the two tests required to become a private pilot. Badger Aviators members volunteer in a variety of programs, from speaking at local high schools to flying EAA Young Eagles flights, Badger Aviators upholds the UW tradition of service and community.